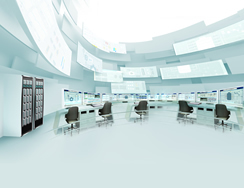 The new CENTUM CS 3000 distributed control system for large-scale plants incorporates the new technologies of OPC, DCOM, ActiveX and Web browsers to offer interoperability through standard data access interfaces and component embedding technology. These new technologies are essential for the CENTUM CS 3000 as a platform to supply solutions. In this day and age, just simply buying a personal computer, taking it home and turning it on will enable you to be taken to the world of Internet. In such an era, communication connection capability and prospects is increasing in importance. DCSs are no exception for concern. Advanced computerization is also required in manufacturing sites. In a plant, a DCS is an intelligent piece of equipment that has control functions and works on the front line of a manufacturing site as well as acting as a centralized warehouse for storing manufacturing information. Although this information is important since production planning and scheduling, cost calculations, and business analyses are performed based on it, there has until recently been no general-purpose interface between a DCS and upper-level systems. The integration of a DCS with an MES and ERP has been difficult. DCSs are required to be systems that can be integrated into a highly computerized society. Information exists in a DCS, MES, ERP, and elsewhere at different hierarchical levels and in different forms. In the time of computerization it is essential to have the capability to share internal and external data with different systems. In other words, open data interfaces are required. The incorporation of these new technologies, has meant that the CENTUM CS 3000 meets the requirements of the times by offering a truly "open data interface" that allows the internal data of a DCS to be accessed from the outside as well as enabling a DCS to access data from outside of itself. OPC is based on Distributed Component Object Model (DCOM) technology that was proposed by Microsoft Corporation for Windows-based networks, and is a specification that stipulates the communication interface for networking environments for PA and FA. Many DCS, PLC, Plant Information and Management (PIM), and Supervisory Control and Data Acquisition (SCADA) vendors are participating in activities to draw up OPC specifications. Yokogawa is also participating in Japanese domestic and overseas OPC workgroups. Traditionally, DCS and PLC vendors prepared the vendors' original interfaces for upper-level systems. As shown in Figure 1, each client therefore needed to prepare a specific interface for each DCS and PLC. This troublesome necessity of multiple interfaces has had the effect of hampering the increase of mutual connections. Figure 2 shows client/server architecture with the incorporation of OPC technology in DCSs and PLCs. In this architecture, each client is only required to have an OPC interface to access data in the DCSs and PLCs of all vendors via an OPC server inside each of the DCSs and PLCs. It is only natural, that such a simple requirement will help increase mutual connections and open systems. For the purpose of providing an open data interface as aforementioned, we have developed an OPC server that runs on a human interface station (HIS) of the CENTUM CS 3000 and conforms to OPC Specifications of the OPC Foundation, as shown in Tables 1 and 2. The CENTUM CS 3000 supplies various process data to upper-level systems via the OPC server. To enable each client to access almost any kind of data in the CETUM CS 3000, custom interfaces are added to the interfaces defined in OPC Specifications, as shown in Table 2. We will propose to OPC workgroups that these custom interfaces be incorporated into standard interfaces in OPC Specifications. In the CENTUM CS 3000, security settings have been enhanced to fill security holes that existed with the insufficient security provided with DCOM. This enables detailed security settings to be made for each client. For example, it is possible to permit only client A to write the SV of FIC100 and only client B to read the PV of TIC200. For an OPC server in a DCS, care must be taken that the operation and monitoring functions are not affected by large amounts of data being accessed for reading and writing too frequently. CENTUM CS 3000's OPC server does not permit access for more than a specified amount of data within a specified time in order to limit the load on each HIS and field control station (FCS) and V-net communication load, thus assuring steady plant operation. Graphic windows of HIS are provided with extensive primitives to allow the building of operation and monitoring windows suitable for the needs of each user. ActiveX controls can be written in a variety of programming languages, including C, C++, Visual Basic, and Java. For example, process data can be obtained via an OPC server and easily processed using an ActiveX control. Also, various forms of presentation including graph displays and DYNAMO-flow diagrams can be added to HIS graphic windows using ActiveX controls supplied from a third party. Since the properties of each ActiveX control can be set using the Graphic Builder, a user- created ActiveX control can be used in different windows for different projects by changing the properties. Control for ActiveX Controls The graphic interface control enables the user to create ActiveX controls to be embedded in a graphic window. 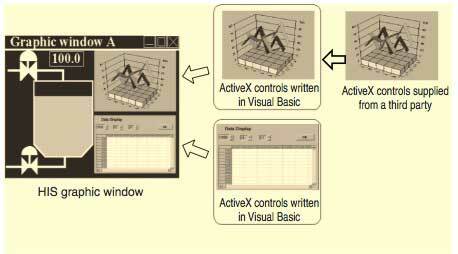 Using properties, methods, and events provided by the graphic interface control (part of these are shown in Table 3), the user can create ActiveX controls well fitted to HIS graphic windows. The graphic interface control itself is also supplied as an ActiveX control and hence it can be used in Visual Basic and other programming languages just like other controls. When creating an ActiveX control, allot the icon of a graphic interface control object in a window, then read and write the properties, methods, and events of that object. This icon is invisible at runtime. In Visual Basic, the graphic interface control acts almost the same as it does during runtime. Hence, ActiveX controls can be debugged easily. The graphic interface control and graphic window exchange data via the Component Object Model (COM) interfaces with each other in order to prevent the performance from being degraded when multiple ActiveX controls are embedded in a graphic window (see Figure 4). Software enabling CENTUM CS 3000's graphic windows to be displayed in a Web browser such as Internet Explorer and Netscape Navigator on a general-purpose personal computer has been developed. Traditionally, data and displays of a DCS were presented to the plant operators, but rarely disclosed to personnel in other departments. However now, there is the demand for a system solution of information sharing in a company, which allows, for example, access by management to data accumulated in a DCS. Using this software, CENTUM CS 3000's graphic windows can be browsed and viewed anytime anywhere via a Web browser. The only requirement is access to any type of PC that is capable of running a Web browser to display graphic windows. An example is given in Figure 5. A Web browser runs on client PCs and displays the HIS's graphic windows. Process data is collected from the HIS via the WWW server. 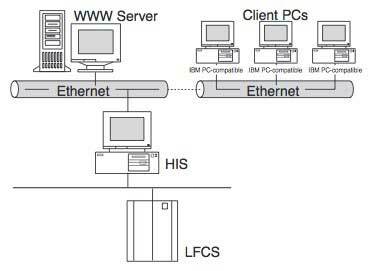 Since client PCs do not directly access the HIS in this configuration, the safety integrity of the DCS system is secured. Using this software, the user can view in any desired Web browser, almost the same windows as the CENTUM CS 3000's graphic windows. This is made possible by converting each graphic object file of the CENTUM CS 3000 into a Java applet. Each Java applet supports functions equivalent to those of the CENTUM CS's graphic windows. Process data is collected via the Data Source Server running on the WWW server from an OPC server running on an HIS. For security, it may be desired to permit only authorized users to access DCS's windows. In this case, security can be set for each Web page so that the graphic windows will only be displayed when a key-code floppy disk is inserted into the computer. - Converts graphic object files of the CENTUM CS 3000 into Java source files. - Creates Java applets from converted Java source files using a Java compiler available on the market. 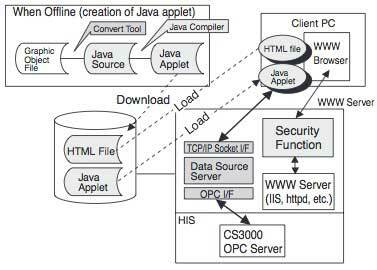 - Java applets draw graphic primitives and acquire process data. Since a user who views these Java applets does not actually operate the plant, Java applets perform data acquisition only when run and do not update the displayed data periodically. To display the updated data, the user must click the button designated by the Web browser. In Netscape Navigator this is the Reload button and in Internet Explorer this is the Update button. - Graphic windows displayed in a Web browser are used only for monitoring and cannot be used for operation. 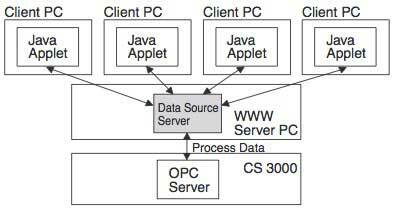 - The Data Source Server is a server that interfaces Java applets with an OPC server by converting the OPC interface protocol to its unique TCP/IP socket interface protocol. - The Data Source Server runs as a service under Windows NT. In order to meet the needs of the times, we must pursue new technologies and incorporate them into the CENTUM series of core products wherever appropriate. By keeping our eyes on the development of new technologies we aim to continue introducing new attractive products in the future. Furthermore, as a major DCS vendor, we are committed to using our extensive expertise in a positive way to help with the activities of stipulating OPC interface specifications. Windows, Windows NT, ActiveX, Visual Basic, C++, OLE, and Internet Explorer are registered trademarks of Microsoft Corporation, USA. Netscape is a registered trademark of Netscape Communications Corporation. Other product and company names appearing in this report are trademarks or registered trademarks of their respective holders.